Spending Tet in a war-torn country 9,800 kilometers away from home can be emotionally challenging, but five Vietnamese military officers serving on a UN peacekeeping mission in Central Africa have managed to keep their spirits high by getting creative and putting together a little Lunar New Year celebration of their own. Lieutenant Colonel Le Ngoc Son was deployed in April 2017 on a year-long United Nations peacekeeping mission to the Central African Republic, where he now works as an intelligence analyst based in the capital city of Bangui. “I had to update military developments, tactical maps, and keep track of the movements of all UN units based throughout Central Africa,” Son said. Joining Son on the peacekeeping mission were four other Vietnamese officers, who were assigned different duties in Bangui and another UN base located thousands of kilometers west of the capital city. According to Son, there are only two seasons in Central Africa – the wet season and the dry season – with temperatures getting as hot as 50 degrees Celsius around February, when Vietnamese people typically observe the Lunar New Year (Tet) holiday. With a population of 50 million spread across an area twice the size of Vietnam, the Central African Republic is an underdeveloped country marred by constant armed conflicts and an ongoing civil war. Son still recalls the days during his mission when the images of bullet shells littering the yard of his UN base and the sounds of gunfire that lasted through the night would haunt him even in his sleep. 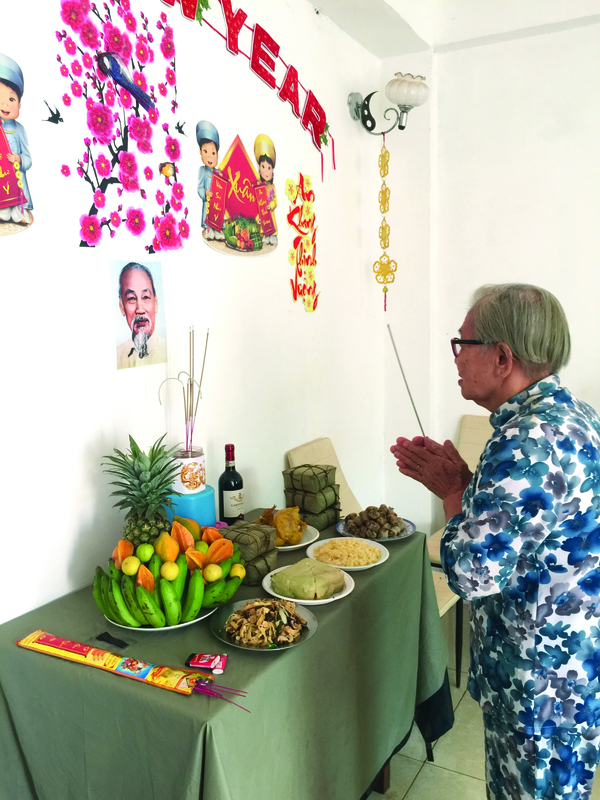 Such little things as putting together a traditional Tet celebration on foreign soil could really go a long way in getting Vietnamese officers through the emotional challenges of their mission, Son explained. Traditionally, any Tet celebration would be incomplete without the presence of ‘banh chung’ on the dining table and ancestral shrine of each Vietnamese family. A dish made from glutinous rice with mung beans and pork filling, ‘banh chung’ symbolizes a Vietnamese belief in the harmony of heaven and earth and is typically eaten in springtime to express desire for a prosperous new year. 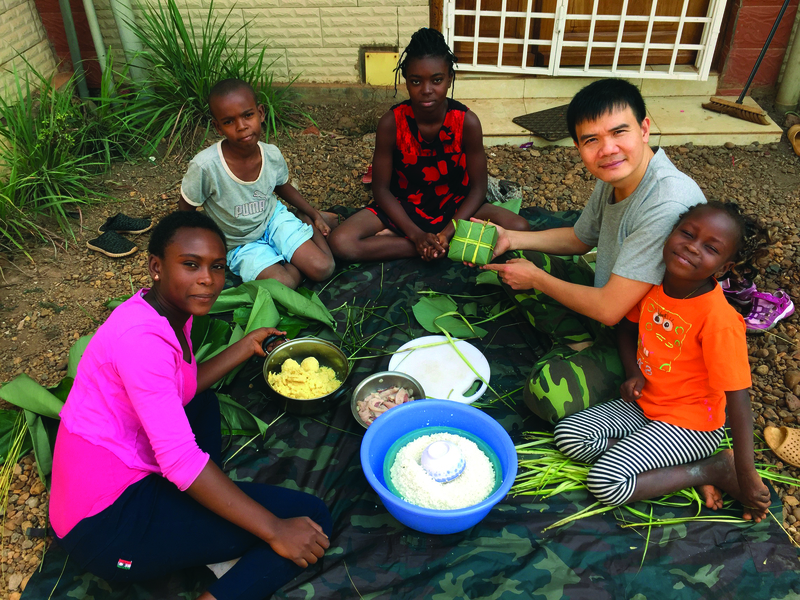 Even with such simple ingredients, ‘banh chung’ is not an easy dish to make given the circumstances in Central Africa, where “it’s hard to get your hands on anything even with money,” Son said. To realize their plan of making ‘banh chung’ for the 2018 Lunar New Year, falling in mid-February that year, Son said he and other Vietnamese peacekeepers had to begin finding the required ingredients months before the holiday. Glutinous rice, mung beans and other spices were readily available as the officers had brought them along from Vietnam when they first took on the mission. The most challenging task was finding leaves of the ‘dong’ tree, scientifically known as Phrynium placentarium, to wrap the ingredients in, which gives the finished cake a nice green color and an unmistakable flavor. “At first I had no clue where to buy dong leaves, as I couldn’t find them anywhere at the markets near where we were based,” Son said. Son said it was by mere chance that he came across a bunch of withered dong leaves at a market one day, but they were not useable because ‘banh chung’ needs to be wrapped in fresh leaves. “I took out my phone and took photos of the dong leaves for my students to see, hoping they would know where to get the leaves fresh,” Son said, referring to the local children he volunteered to give free math lessons to. It turned out that Central African people let dong leaves wither to use them as wrapping for a local cake, Son said, adding that his students managed to get him four stacks of the fresh leaves for his Tet plans. Buying pork was another challenge for Son and his fellow Vietnamese officers, as the meat was not sold at any of the local markets. “I’m guessing it’s because of religious reasons,” he said. Fortunately, he was able to find pork at a local market. To shape ‘banh chung’ into a perfect square, a mould is made from wood, plastic, or metal. Son resorted to using thick cardboards and bending them into the shape of a mould to be used for wrapping ‘banh chung,' as square moulds are not readily available where he was based. As Lunar New Year is not a public holiday in the Central African Republic, the Vietnamese officers decided to celebrate the occasion one week early to avoid scheduling conflicts with their assigned duties. Organizing the celebration in the evening was also out of the question, as electricity was a scarcity in the country, even in the capital city of Bangui. “It’s pitch black at night in Bangui, so there was no way we could have held the New Year party in the evening,” Son said. Son and fellow Vietnamese peacekeepers were joined by local children as they put up Tet decorations and cooked ‘banh chung,' which took ten hours to finish. A five-fruit tray, which is an indispensable part of the Tet celebration of every Vietnamese family as it symbolizes the respect of the present generation for their ancestors, was also put together using substitute fruits that are available locally. Starfruits and limes were used in place of a mango and coconut in a traditional Vietnamese five-fruit tray, with the remaining fruits being bananas, a pineapple and a papaya. 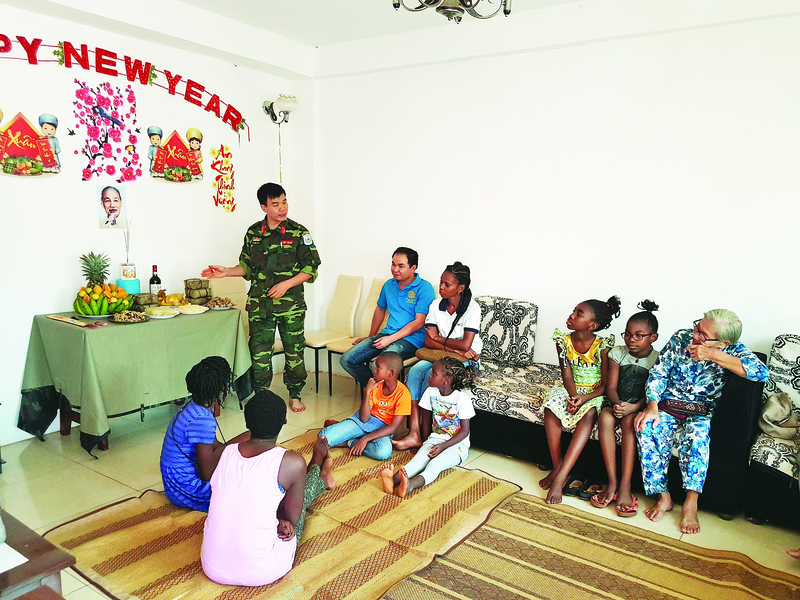 Apart from Central African children, joining the Vietnamese officers in the cozy New Year get-together was Mrs Luyen - a Hanoi-born woman who had been away from her home country for nearly 70 years. Married to a legionary and having settled in the Central African Republic for decades, Luyen said she was the only Vietnamese woman in Bangui. Her husband died at a young age, and Luyen has since his death led a single life to raise their children, having never returned to Vietnam to visit her home country. Lighting an incense stick to offer prayers to her ancestors, Luyen appeared shaken as she had almost forgotten the tranquilizing smell of burning incense.  “I thought I would never live to celebrate another Tet,” Luyen said. Captain Ho Tien Hung, a Vietnamese UN peacekeeper based in Bangui, said it made him feel homesick to read about how his countrymen celebrate Tet in the news. Everything was different in Central Africa: there were no flowers or decorations – only people rushing to get home safely, fearing for their lives. “It helped me realize what a treasure it is to live in a peaceful country like Vietnam,” Hung said.